3D Modelling of Equipment, Piping, Civil Structure and Electrical Raceway will be prepared for error-free documents, verification of clashes in the model and smooth execution of erection / procurement activities. 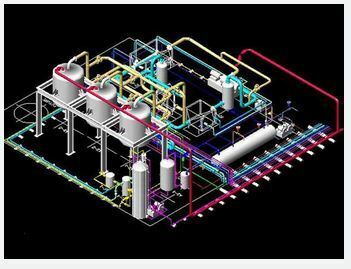 3D Model once prepared can be used to extract various essential documents like Bill of Material, Isometrics, General arrangement Drawings, Clash Reports etc.We can also update 3D Model based on As-Built plant conditions. TechReach Engineering Services provides Engineering & Services from concept-to-completion design. We understand that each client and their requirements are unique and we customize our services to provide the best to our clients. As a part of our integral engineering design services, engineers develop meticulous documentation for Process, Piping, Mechanical, Civil, Instrumentation, Electrical to move from initial planning stage to procurement and construction. Moreover, this provides our clients with a single-stop solution for all design and engineering needs. We are a fully integrated Design, Services & Project Management Consultancy having competence in following areas.